Masada, an ancient Jewish fort seating on top of a square shaped mountain in the Dead Sea area, is known as a place where Jewish warriors fought Romans soldiers until the bitter end; rather than surrender and convert, the people of Masada chose instead to take their own lives and remain faithful to their God. 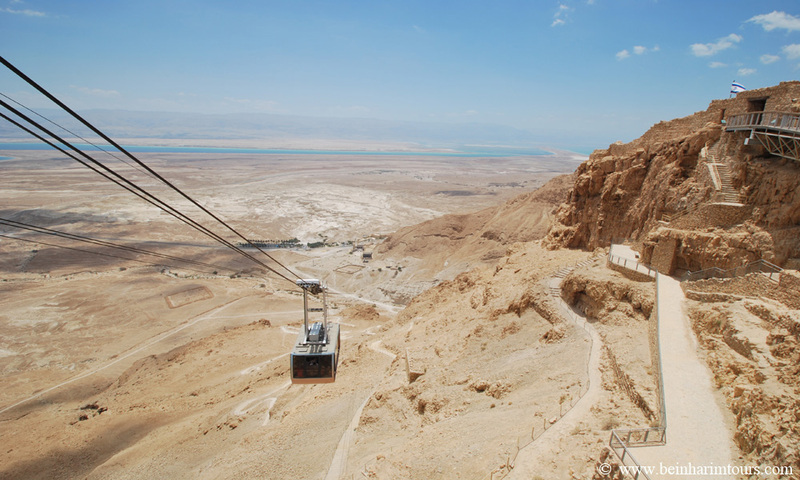 Today Masada is a popular touring site in which visitors can climb the tall and beautiful mountain, see the archeological remains from the great battle and hear the story of bravery against all odds. If you are interested in a unique and exciting one day Israel tour, let us tell you about some of the things you're likely to see when visiting Masada. What to see: during the evening, am impressive multimedia light show takes place on the Masada site and retells the story of the battle for Masada. The Dead Sea is a beautiful and unique place. Considered the lowest point on earth's surface, the Dead Sea is filled with helpful minerals, great views and great weather. Because of its proximity to Masada, nearly every day tour of the ancient city is supplemented by a visit. If you like combining exciting travel with relaxation, make sure to get a tour of Masada that includes the Dead Sea.